Not only was she was the most modern and powerful ship in the fleet at the time, she was also the first battleship designed by Japanese naval architects. 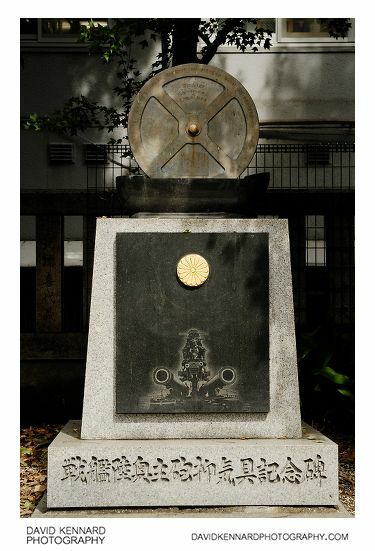 Her construction had been funded by public subscription, most notably Japanese school children, which meant that she was greatly admired by the Japanese people. 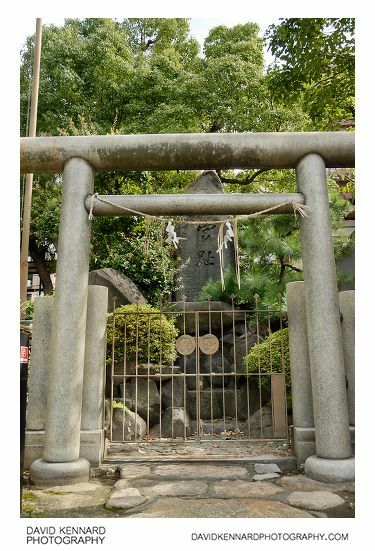 In part of the shrine was this large rock, behind metal gates and a large stone torii. I couldn't find much information on what this rock represents or why it is special. Carved into the rock are the characters '宮趾', which seems to mean something like 'great toe'. I guess it could be that the menhir shape of the rock makes it look a bit like a toe or finger. The photo above is part of the main building of the shrine. Hanging from the ceiling you can see lots of Tsuri-dōrō (釣灯籠) lanterns. 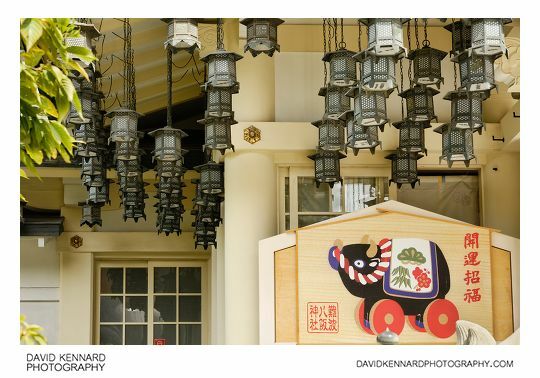 In the bottom right corner of the photo is a bull on wheels, which shows the design of Ema (絵馬) prayer plaques that can be bought at the shrine. Unfortunately I couldn't find any information on the significance of a bull on wheels. 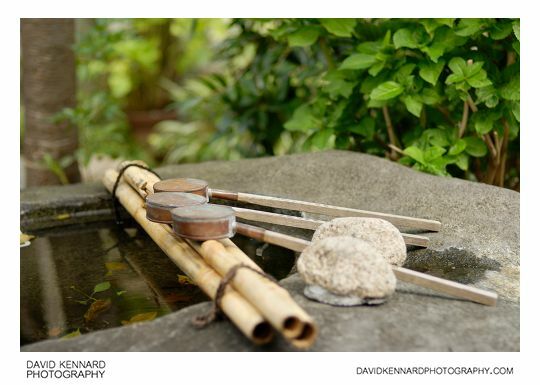 Part of the Shinto rituals involves purifying yourself with water, and a water basin and ladles are provided for this. Worshippers wash their left hand first, then their right, rinse their mouth, and then tip the ladle backwards to wash the ladle handle with the remaining water before placing the ladle back down. This water purification ritual is known as Temizu (手水). For the above photo, I actually focused on the middle ladle, but my camera was suffering from back-focusing issues at the time, and so the rear ladle is actually more in focus. Still, I think it's an okay photo. 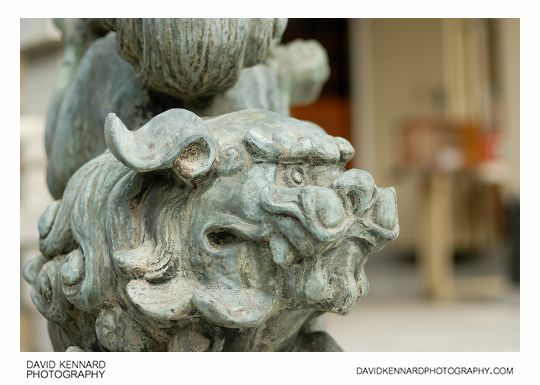 This is a bronze komainu (狛犬) statue. Although I originally thought they were meant to be dragons, they are actually based on lions. The name 'Komainu' literally means 'Korean dog', and the statues were probably introduced into Japan through trade with Korea (which itself would have received the tradition from China). The statues are used as guardians against evil spirits at shrines, and are almost always arranged in pairs. 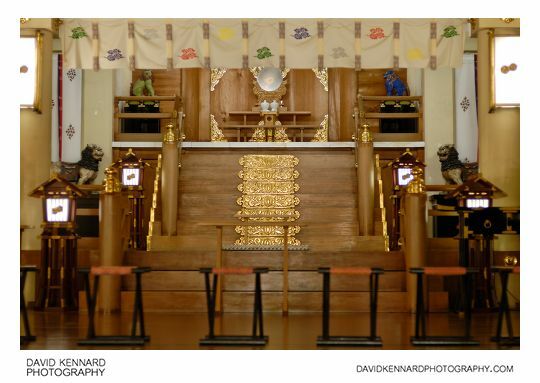 This is a photo looking inside the main building of the shrine. You can see they have some more komainu inside the shrine building, and also a couple of small wooden torii gates near the bottom of the steps.